The Alpaca comes from South America living in the Andes, mainly in Peru and Chile. They are part of the Camelid family and are the smaller cousin of the Llama. There are 2 breeds of alpaca the Huacaya and the Suri which are both bred for their fine luxurious fibre which can be found in the haute couture of the fashion industry. They are a very hardy animal, being able to cope with extreme changes of temperature in the weather – originating from the Andes where it is very hot in the day and very cold at night. The fibre does not retain water, is thermal even when wet and can resist ultra violet light effectively. They live in herds and can survive on sparse vegetation. However in a domestic situation they are fed hay and a little concentrate is fed to pregnant females and the young cria to ensure they get the required vitamins and minerals. Females have a gestation period of 11.5 months usually having one cria. 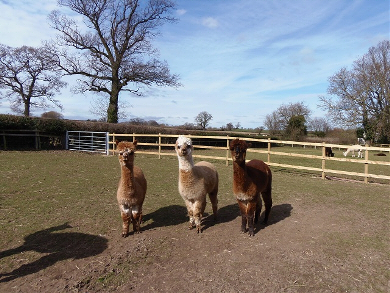 They can have cria all through the year but its best in the spring through to autumn when there is plenty of sunlight. They are usually shorn annually but can be left for a couple of years to get a thicker fleece and the fibre is processed into yarns knitwear,blankets,and various accessories depending on the grade of the wool. Alpacas are shorn annually, usually in the spring before it gets too hot, by professional shearers who travel around from farm to farm and/or country to country. The fleece taken off the animal can weigh between 1.5 – 4kgs. 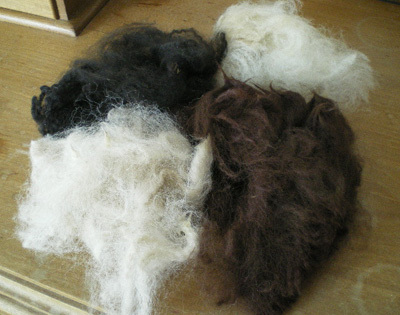 The 2 types of alpaca – Huacaya and the Suri show differences in their fibre, the Huacaya resembling a very soft sheep wool with a dense crimp and shorter staple where as the Suri has a longer fleece which is curly, has no crimp and hangs down the side of the animal like an angora goat. The fineness in both wools can range from 18-35 (the lower the micron the finer the wool). 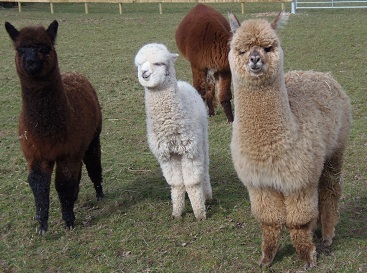 Alpacas have up to 20 different shades of colour ranging from white, various shades of fawn, brown, grey and then black. The best part of the fleece has a non prickly factor and can be worn next to the skin and is also hypoallergenic having very little lanolin. Alpaca is a hollow fibre which has very good insulating properties so when made into garments it provides warmth without the weight. All the fleece can be used, the best part being spun and made into all sorts of garments and woven cloth, the rest being made into felt and the short bits of the fleece can be used in the garden to protect the plants, for hanging baskets and it is perfect nesting material for the birds! The Alpaca is a very hardy animal and fairly low maintenance. They are very happy to live outside all year round as long as they have some form of shelter against the sun and extreme wet. As they are herd animals they need to be kept in groups, the minimum number would be 3 as they do form close knit groups. In terms of feeding in our climate they require hay all the year round and the pregnant females and youngstock require a daily handful of concentrates to make sure they have the required minerals and vitamins. Depending on the quality of the grass they sometimes need a boost of minerals and vitamins as an injection. The stock level can be up to 10 per hectare, and if possible it is best to rotate the grazing. It is necessary to worm annually or Â½ yearly depending on how much grazing is available. It is also necessary to keep an eye on their feet as their toenails tend to grow quite long and will need trimming if kept on soft ground. Blue tongue vaccination is advised if living in a blue tongue area.